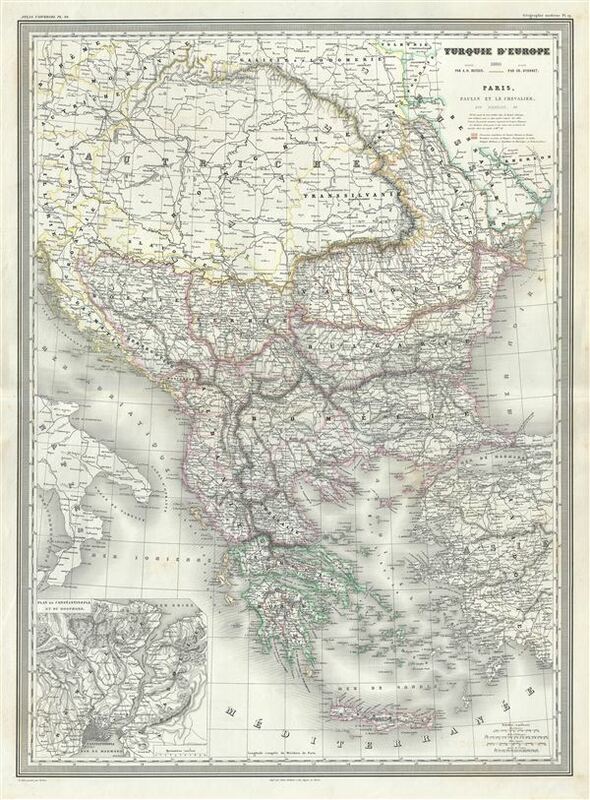 This is a beautiful 1860 elephant folio map of Greece, the Balkans and the European part of Turkey by A. H. Dufour. It covers from Moldavia to Candia or Crete and from the Gulf of Venice to the Adriatic Sea to the Sea of Marmara. The modern day states of Greece, Albania, Moldova, Bosnia, Croatia, Serbia, Bulgaria and Romania are included. Throughout, major towns, cities, rivers, mountains and other topographical features are noted. An inset plan of Constantinople and the Bosporus in included in the lower left quadrant. This map was prepared by Auguste-Henri Dufour and engraved by Charles Dyonette for publication plate no. 28 in Armand Le Chevalier's 1860 edition of Atlas Universel, Physique, Historique et Politique de Geographie Ancienne et Moderne.